Gold and silver advanced for a second consecutive week. 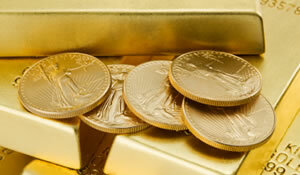 U.S. Mint bullion coins notched strong gains. Gold, silver and other precious metals notched solid gains this week. But on Friday, gold futures for February delivery declined $3.80, or 0.2%, to end at $1,687.00 an ounce on the Comex in New York. The loss pulled prices back from Thursday’s more than one-month high, though gold still climbed 1.6% for the week for a second straight weekly advance. The higher weekly close "may embolden gold bulls who are expected to come back into the market," MarketWatch relayed comments from Mark O’Byrne, research director at GoldCore. "Similarly, the surge in silver prices this week could lead to follow through technical buying next week." Bulls overshadow the bears in weekly gold surveys. In Bloomberg’s survey of analysts and traders, 19 participants expect higher gold prices in the coming days compared to 10 who were bearish and 4 neutral. Kitco’s survey is also weighted bullish. "In the Kitco News Gold Survey, out of 33 participants, 26 responded this week. Of those 26 participants, 18 see prices up, while three see prices down, and five see prices moving sideways," reports Kitco. "The gold market has put in a choppy trade for 2013, but after holding support at this week’s lows at $1,669.40 an ounce and then rallying on Thursday off of session lows to close with gains, most participants in the Kitco News Gold Survey said they expect prices to have enough momentum to take out resistance at the $1,700 an ounce area…"
Year-to-date, gold is under performing when compared to other precious metals. It has gained $11.20, or 0.7%, in 2013. March silver prices added 12.2 cents, or 0.4%, to $31.932 an ounce. The settlement is a fresh, nearly five-week high. Silver led metals this week, rising 5.0% for a net gain of $1.52. Like gold, it also extended its weekly winning streak to two after falling for six straight. Platinum for April delivery fell $26.50, or 1.6%, to $1,674.00 an ounce. Despite the sizable loss, for the week it gained 2.6%. While giving away the advantage Friday, platinum on Tuesday topped gold for the first time since April. That day’s gains of $31.70 came on news of planned production cuts from the world’s largest platinum producer. Sister metal palladium retreated as well Friday. March palladium dipped $3.40, or 0.5%, to $722.75 an ounce. Palladium advanced 3.0% this week. Across the group of metals so far this year, gains include 5.6% for silver, 8.5% for platinum and 2.8% for palladium. Each of the metals in London notched gains this week. Increases were 1.9% for gold, 3.7% for silver, 3.1% for platinum and 4.1% for palladium. Sales levels on Friday, seen in the table below, advanced across all sizes of American Eagle gold coins. Companion silver coins sat in silence as the U.S. Mint’s inventory of them sold out Thursday. As a result, Silver Eagle sales are suspended until at least the 28th. American Eagle silver coins at 6,007,000 mark the third highest monthly total since the series debuted in 1986. American Eagle gold coins at 127,000 ounces are higher than monthly totals for all but one month in 2012. November 2012 logged sales of 136,500 ounces, which is the highest amount for a month since July 2010. American Buffalo gold coins at 39,500 are the strongest since May 2010. Gold bullion coins totaled 32,500 ounces compared to 54,000 ounces in the prior week. Splits this week are 29,500 ounces in 22-karat American Eagle gold coins and 3,000 ounces in 24-karat American Buffalo gold coins. Silver coins totaled 1,229,000 ounces with splits of 1,225,000 in American Eagle silver coins and 4,000 in America the Beautiful Five Ounce Silver Bullion Coins. Last week sales for these coins tallied to 4,827,500. The latest daily, weekly and year-to-date bullion coin sales follow.